Parts better than the whole: remarkable locations and a stunning performance fail to save this memoir from ordinariness. 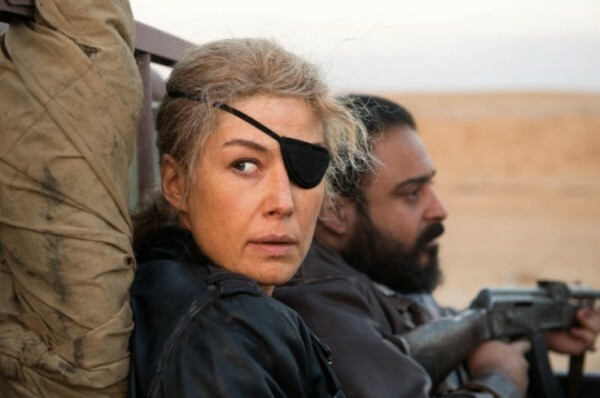 A Private War seeks to tell the story of the struggle, achievement, and early death of the American journalist Marie Colvin, who wrote for The Sunday Times. Rosamund Pike delivers a pitch-perfect performance as Colvin and there are extraordinary locations recreated by the director, Matthew Heineman, who has a close knowledge as a documentary filmmaker of the battle zones of the Middle East depicted here. But unfortunately this is not that wonderful a movie, nor is it one people will rush to see. Why is that? The second part is easy to answer: people will find the scenes too harrowing, both the horrific battle zones and the disaster of Colvin's personal life marked by crumbling relationships and alcoholism (she was also a chain smoker). The movie is disappointingly conventional despite being about an extraordinary person and remarkable events. There is nothing that special about Colvin's dilemma. She was too sensitive to endure the traumatic scenes she felt compelled to cover. We see her successively in Sri Lanka, where she lost an eye, Falluja, with its revelations of Saddam's murders of innocents, Afghanistan, Libya in the revolution where she interviewed an enamored Qaddafi, and deep in the battle of Homs, Syria, which she said was the worst war she had ever seen, and where she died covering the fate of 28,000 innocent civilians trapped and slaughtered by al-Assad's government forces. These are the main locations, with trips back to England in between, and Heineman's recreations of them are remarkable, unflinching, thorough, but designed to be real, not to impress. Actually Colvin's life and accomplishments were more extraordinary than the film shows, though it does show how she kept picking up awards that insured her job security with the Times no matter how irregular her off-duty behavior became - which her editor Sean Ryan (Tom Hollander in a complex performance) had to deal with. We see her spend time in a posh sanatorium for her reluctantly admitted Post Traumatic Stress Disorder. We realize that high level international journalists who specialize in war zones over many years can have worse PTSD than a combat soldier. And we're reminded that such journalists are addicted to the stress, the excitement, the danger: adrenaline junkies. One trouble is that for us if not for Colvin it partly feels like one war zone is much like another; all provide the same adrenalin rush. Colvin's gulping of vodka and puffing on ciggies becomes routine too, repetitive, a cliché. And her men, handsome, glamorous, rich though they may be, including a husband she married and divorced twice and a sybarite played by Stanley Tucci (who brings some welcome fun, but only for a few minutes) - they don't have a chance to become three-dimensional. Rosamund Pike deserves an Oscar nomination for this performance, but she won't win, because the movie isn't interesting enough. A life this extraordinary called for more creative writing than Marie Brenner's screenplay, based on Arash Amel's Vanity Fair article "Marie Colvin's Private War." The structure, a countdown to Homs, and her death, over an eleven-year period, war zone by war zone, is trite. The idea, a focus on Colvin's "inner demons," the flashbacks (especially to an Arab girl lying dead, which sometimes she imagined lying on her own bed), is problematic, because it undercuts Colvin's humanitarian achievements and journalistic feats, such as submitting a 3,000 on-deadline story immediately after being blinded in the left eye. There is too much about the on-site reporting to develop adequately the theme of personal suffering. In the end what seems most remarkable is the mise-en-scène. Aided by by three time Oscar winning cinematographer Robert Richardson (who's worked for Stone, Tarantino, and Scorsese), what's jaw-droppingly good is how the film, using Jordan for the locations, can recreate Sri Lanka, Iraq, Afghanistan, Libya, and Syria war zones. Heineman's fine documentary work, especially last year's City of Ghosts, served him well here. Fortunately the sense of place and Pike's acting come together most powerfully is in the final sequence, where she refuses to flee from the ravaged city of Homs and remains, with her by then faithful photographer, Paul Conroy (Jamie Dornan), to deliver a live interview to Anderson Cooper. You will know how this ends, but it's still breathtakingly real and sad. A Private War's settings and the performance are both, separately, impressive. But they don't come together into a continually impressive whole, lacking the writing to make that happen. A Private War, 110 mins., debuted at Toronto. Presented in at leaat a half-doen other festivals, including Mill Valley, Vancouver, Chicago, and London. US release 16 Nov. 2018. Metascore 76. Marie Colvin's actual last broadcast to CNN (more matter-of-fact than the film). Last edited by Chris Knipp; 11-24-2018 at 01:02 AM. A puzzling Chris commentary in which he appears to both lavish and deride this movie at the same time. He writes that "this is not that wonderful a movie nor is it one people will rush to see." He also finds this movie "disappointingly conventional." 1. "Rosamund Pike delivers a pitch-perfect performance as Colvin." 2. "(T)here are extraordinary locations recreated by the director, Matthew Heineman, who has a close knowledge as a documentary filmmaker of the battle zones of the Middle East depicted here." 1. "the scenes too harrowing, both the horrific battle zones and the disaster of Colvin's personal life marked by crumbling relationships and alcoholism (she was also a chain smoker). 2. "The movie is...about an extraordinary person and remarkable events." 3. "Heineman's recreations of them (many trips) are remarkable, unflinching, thorough, but designed to be real, not to impress." 1. "She was too sensitive to endure the traumatic scenes she felt compelled to cover." 2. " We see her successively in Sri Lanka, where she lost an eye, Falluja, with its revelations of Saddam's murders of innocents, Afghanistan, Libya in the revolution where she interviewed an enamored Qaddafi, and deep in the battle of Homs, Syria, which she said was the worst war she had ever seen, and where she died covering the fate of 28,000 innocent civilians trapped and slaughtered by al-Assad's government forces." 3. "Actually Colvin's life and accomplishments were more extraordinary than the film shows, though it does show how she kept picking up awards that insured her job security with the Times no matter how irregular her off-duty behavior became - which her editor Sean Ryan (Tom Hollander in a complex performance) had to deal with. We see her spend time in a posh sanatorium for her reluctantly admitted Post Traumatic Stress Disorder. We realize that high level international journalists who specialize in war zones over many years can have worse PTSD than a combat soldier. And we're reminded that such journalists are addicted to the stress, the excitement, the danger: adrenaline junkies." How can such experiences not be "special," except to the few of the brave media who actually did endure such horrors? Chris may be expecting such a high standard for depicting real life in the war zone that he finds this movie becoming "routine" and not sufficiently "three-dimensional." Yet for me it is for these very reasons that this movie succeeds because it does depict more of real life, strangely in a odd way that the old television series like Adam-12 depicted police officers and Emergency depicted paramedics. If life became in this movie so three-dimensional as Chris expects, it would necessarily become a mainstream, over-the-top fiction defeating the very essence of good movie making and the purpose that this movie sought. Personally, I did not find this movie in anyway "trite" as Chris found it, but a compelling, captivating, if not disturbing look into what movie audiences and the mass media and our government have failed to discover - the terrible toll that war takes on real lives and civilians. It was not until news reporters had the guts to photograph the Civil War dead and capture the attention of the American public with videos of Vietnamese being burned alive that America truly woke up and demanded the end to human suffering. Even though Chris complains of the inner focus of this movie, it is the very essence of humanity that we need to take a close look at the mental trauma inflicted upon people and Colvin that we can begin to really appreciate and honor the sacrifice that she and others in her field require and deserve. This is human-interest at its finest.